Irrigation Design and Installation is the backbone of any beautiful lawn and landscape. A professionally installed sprinkler system, not only saves you from having to haul hoses to water your yard or landscape, but the efficiency of the system saves money and conserves water. There are many factors that affect an irrigation system design; sun exposure, soil type, and slope to name a few. Forest Lake Lawn and Landscape has 20+ years of experience designing and installing irrigation systems, in Lincoln Nebraska and the surrounding communities. We can also help you refurbish, maintain, or extend an existing irrigation system. Our installation process is quick and comes with a warranty. 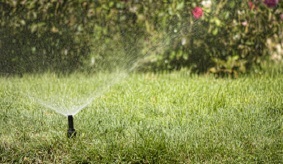 Forest Lake can design and install a customized irrigation system specifically tailored for your property. Give us a call today!